Situated on the Strip, this hotel is within 1 mi (2 km) of Karon Market and Karon Beach. Kata Beach and Kata Porpeang Market are also within 3 mi (5 km). A restaurant, a bar/lounge, and dry cleaning are available at this hotel. Free WiFi in public areas and free self parking are also provided. Additionally, a computer station, a library, and express check-in are onsite. 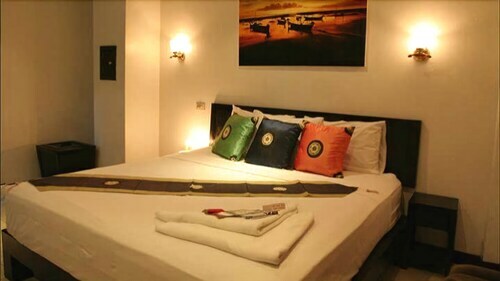 All 15 rooms provide conveniences like sofa beds and coffee makers, plus free WiFi and flat-screen TVs with satellite channels. Other amenities available to guests include MP3 docks, DVD players, and room service. The hotel offers a restaurant. A bar/lounge is on site where guests can unwind with a drink. A computer station is located on site and wireless Internet access is complimentary. This business-friendly hotel also offers a library, tour/ticket assistance, and multilingual staff. Onsite self parking is complimentary. Cooked-to-order breakfasts are available for a surcharge and are served each morning between 10 AM and 1:00 PM. Augus O'Tool's - This restaurant specializes in international cuisine and serves breakfast, lunch, dinner, and light fare. Guests can enjoy drinks at the bar. Open daily. Start your morning with a cooked-to-order breakfast, available each day from 10 AM to 1:00 PM for a surcharge. You can order a meal from room service during limited hours. The front desk is open daily from 10 AM - 1 AM. If you are planning to arrive after 1 AM please contact the property in advance using the information on the booking confirmation. A resort fee is included in the total price displayed. No pets and no service animals are allowed at this property.